Cannabidiol (CBD) is one of at least 113 active cannabinoids identified in the cannabis plant. CBD is considered to have a wide scope of potential medical applications – due to clinical reports showing the lack of side effects, particularly a lack of psychoactivity (as is typically associated with THC), and non-interference with several psychomotor learning and psychological functions. HelloMD and Brightfield Group performed a fascinating study in 2017 on the usage of CBD products and effectiveness. Some of their findings can be found in the Infographic to the right. 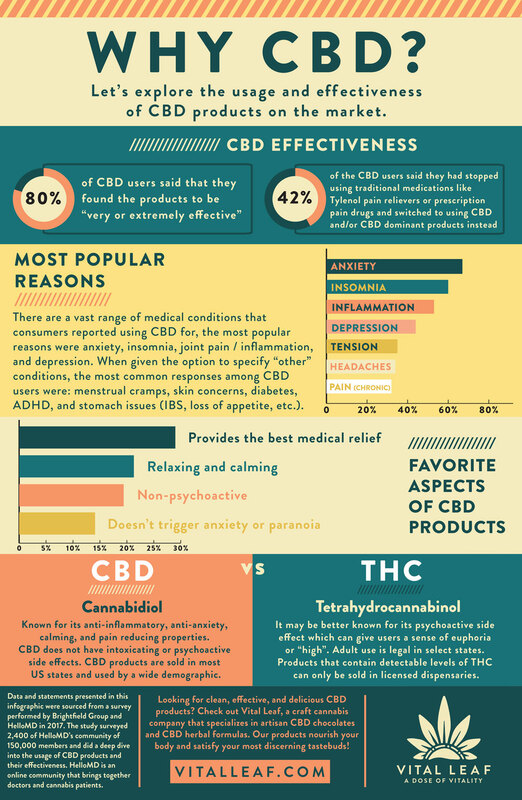 Learn more about the benefits of CBD oil here.